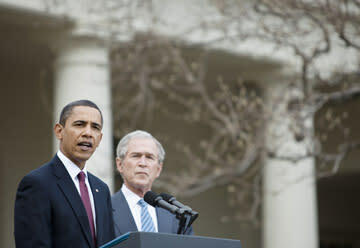 It's been the centerpiece of the Democrats' push in 2010: the argument, echoed by President Obama and others, that a vote for a Republican this fall would mean a return to the "failed policies" of George W. Bush. But a new Washington Post/ABC News poll confirms that a majority of voters, including a surprising number of Democrats, aren't buying it. According to the poll, 49 percent of likely voters believe a GOP-controlled Congress would mean a "new direction" for the country, compared with just 42 percent who believe Republicans would return to Bush policies. But perhaps the most interesting nugget on this polling is buried in the Washington Post's writeup of the results, which includes a breakdown of how Democrats poll on this question. According to the Post's Dan Balz and Jon Cohen, almost a quarter of Democrats believe a Republican-led Congress would take the country in a "new and better direction." The same number of Democrats say a return to Bush's policies would be a good thing. That's hardly a majority of the party -- but it's a sizable enough number to suggest that Dems still haven't sold their own base on an argument that's pivotal to their fate on Election Day. Why is this important? As The Upshot reported last week, a Public Policy Polling survey found that a majority of undecided voters in the nation's most closely watched races are Democrats. If the party has a prayer of preventing major GOP gains on Election Day, Democrats not only need to win over a significant number of independents; they will also need to turn out their base. But the Post/ABC poll suggests that not all Democrats view Bush as a bogeyman, which isn't a good sign for Obama and the Democrats. Voters also seem to be skeptical about another key Democratic argument: that the GOP has been hijacked by conservatives and tea party types. Asked about GOP candidates for Congress, 40 percent of likely voters believe their views are "about right," compared with 35 percent who think they are "too conservative." Asked specifically about so-called tea party candidates, 42 percent say their views are "about right," compared with 35 percent who say they are "too conservative." Still, the Post/ABC poll, like other recent surveys, offers additional signs that Election Day could still be unpredictable. For one, both parties have dismal approval numbers — but voters show a slightly higher tolerance for Democrats. (Their disapproval number is 61 percent, compared with the GOP's 67 percent.) Democrats have also gained in voters' views of who will best handle certain issues. On the economy, 44 percent of likely voters believe Democrats will handle the issue better, compared with 37 percent for Republicans. At the same time, 55 percent of likely voters say they are inclined to "look around" for a candidate this fall as opposed to re-electing their current representative. That's a bad sign for Democrats — who hold the majority in Congress — but also for Republicans who, to win control of Congress, must not only win Democratic districts but maintain their own seats.